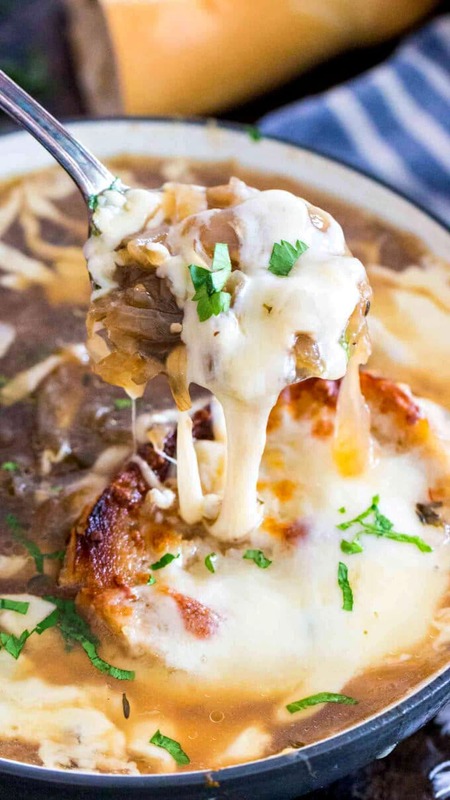 Instant Pot French Onion Soup is a restaurant quality soup, easily and comfortingly made at home. It is loaded with caramelized onions, beef broth, and topped with Gruyere cheese, for the perfect finish! We love making dishes in the Instant Pot because it’s convenient and usually done at a fraction of time. Like the Taco Soup and Baked Potato Soup, this French Onion Soup will quickly become your go-to soup. 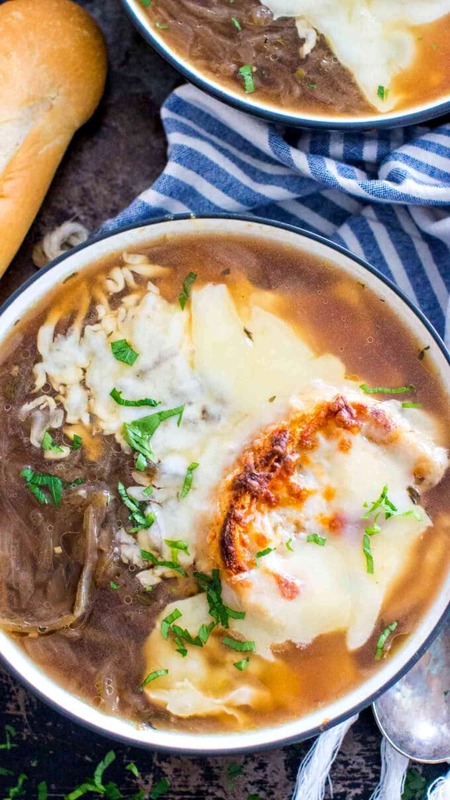 This Instant Pot French Onion Soup recipe is absolutely delicious. Unlike many other soups done in the pressure cooker, this one requires some extra time and attention in caramelizing the onions. After making this soup multiple times, we have come to the conclusion that for a perfect version of it, you will basically need to follow two important steps. 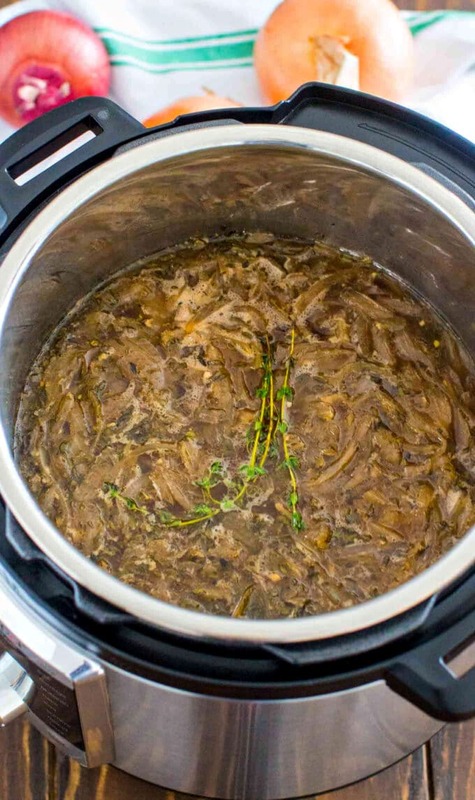 This step takes some additional time to do in the Instant Pot. On average, it takes about 15-20 minutes to fully caramelize the onions. Hence, make sure to set time aside for the caramelizing part. Caramelizing is a process that occurs when sugar is added to the onions, and when they become brownish in color. Since broth is the main ingredient here, make sure to use organic and high-quality broth. Your soup will only be as good as the stock you are using. The traditional French Onion Soup is made with beef broth, and this is what we have used here. So if you use boxed beef broth, taste it first! Add butter, sliced onions, and brown sugar to the pressure cooker. Saute for about 15-20 minutes or until onions are golden brown and caramelized. Next, add garlic, red wine, Worcestershire sauce, and the seasonings. Stir for 1-2 minutes. Then, add the beef broth. Seal pressure cooker and set to cook on high pressure for 20 minutes. After the time is done, release pressure naturally for 15 minutes, then release the remaining pressure by opening the vent. Before serving, top the serving bowl with a slice of baguette and plenty of Gruyere cheese. Place in the oven for few minutes to broil. Broil until cheese is melted, and has a golden brown color. For deeper flavor, you can even use Bone Beef Broth. Alternatively, you can substitute the beef broth with chicken broth. For a vegetarian version, use vegetable stock. Top the soup with your favorite cheeses. We have used Gruyere cheese, but a combination of provolone, Swiss or Parmesan will work just as well. 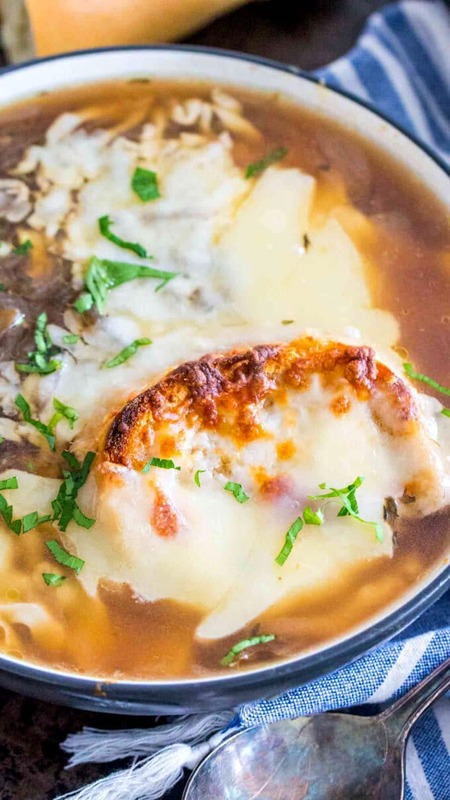 How to best serve Instant Pot French Onion Soup? This delicious homemade soup is best to be served right away. Add some cheese on top, and use a fresh baguette for dipping. Also, it’s best to use cheeses which have some sharpness to them such as Gruyere or aged Beemster. The soup can be stored in the fridge for up to 5 days. When ready to serve, heat the soup in a pot, and pour the soup into ceramic bowls. To create the cheesy bread topping, arrange baguette slices on top of each bowl, with some shredded or sliced cheese. Then, put under the broiler for a few minutes until cheese is bubbly and golden brown. Turn on the Instant Pot and Select Sauté mode on High. Once it reads HOT, add the butter, and stirring with a wooden spoon, melt it. Add sliced onions and brown sugar to the Instant Pot. Sauté for about 15-20 minutes or until onions are golden brown and caramelized. Stir occasionally. Next, add minced garlic, thyme, red wine, Worcestershire sauce, and salt and pepper to taste. Stir for 1-2 minutes. Then, add the beef broth. Make sure you do not go over the MAX line of the inner pot. Seal pressure cooker lid and cook on high pressure for 20 minutes. Followed by a 15 minutes Natural Pressure Release. After the time is done, release remaining pressure by allowing steam to vent, then remove the lid. Stir the soup. Before serving, top each serving bowl with a slice or two of French baguette and some sliced or shredded Gruyere cheese. 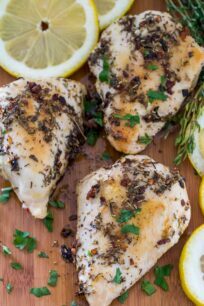 Place the bowl on a baking sheet and transfer into the oven for few minutes to broil. Broil until cheese is melted, bubbly and has a golden brown color. One of my all-time favorites, love the sound of this IP version! Looks heavenly! Nothing beats an Instant Pot soup this time of the year! Such a gorgeous soup!! I love that you made it in the Instant Pot! So much quicker than the slow cooker! 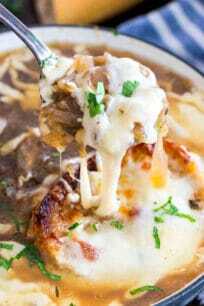 I’ve had instant pot French onion soup on my must make a list for a while, I cannot wait to try your recipe, it looks amazing! 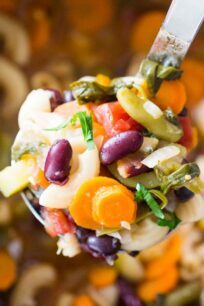 the easiest way to my my all time favorite soup! i’m positively giddy over this! Really tasty! I had to saute low to caramelize, it was burning too quick for me even though I was standing right there. I personally would add more onions for the second cook, the ratio of broth to onion “strings” was off for me. Delicious recipe, but all your recipes are delicious. The soup is amazing the only thing we find is that the onions taste sweet in the soup. 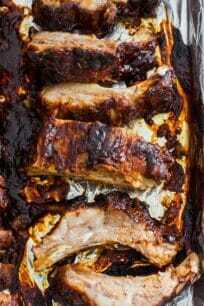 Is there anything we can do to make it more savory now that has been cooked. Skip the brown sugar if you don’t like the sweetness, and next time use regular yellow onions, not sweet. Also, you can add a bit more Worcestershire sauce. What is the herb sprig in the photo? I don’t see it listed in ingredients. EXCELLENT!! I did mix sweet with yellow onions and turned out so good. This is a forever recipe! Any danger to cooking with wine in the IP? I see many warnings not to use alcohol even in a stovetop pressure cooker. Also, I assume that the alcohol does not cook off like it would in a traditional recipe, so this recipe would not be particularly safe for children, correct? The alcohol doesn’t fully evaporate as it does on the stove or in the slow cooker. If you want to serve this to kids, all you have to do, after Pressure Cooking, open the IP, click on Saute and simmer the soup for 5-10 minutes, to make sure the alcohol evaporates. I would also imagine that a cup of wine cooked for 2 minutes and then diluted into 64 ounces of broth would be pretty low in alcohol conent.